Questions about the Eric Morris 26-5017 ? 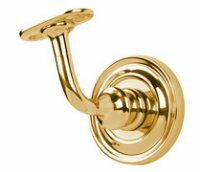 Brass Handrail Bracket with Small Traditional Rosette - Base attaches to wall with a 5/16" x 2.0" hanger bolt and three #10 x 2.0" steel wood screws. Saddle is attached to the bottom of the rail w/two #12 x 1.25" wood screws. Handrail Brackets are supplied standard for tlat bottom rail. Projection: Wall to centerline of railing - 2.625"; Clearance: 1.625" using 2.0" outside diameter rail; Standard Saddle: 1.0" wide x 2.0" long flat.